In that blog I suggested that it would be interesting to see a poll conducted in the Muslim world to see how popular this extremist group is. Well since then, a poll has been carried out about the popularity of IS (also known as ISIS), not in the Islamic world, but in the UK, France and Germany. These countries have the three most powerful economies in the EU. The poll was taken by ICM Research for the Russian news agency Rossiya Segodnya. ICM research is a well-known UK polling company which has carried out polls for reputable publications such as The Guardian, The Sunday Telegraph and The Scotsman publications, among others. And the result? well look at the snapshot below of the survey. 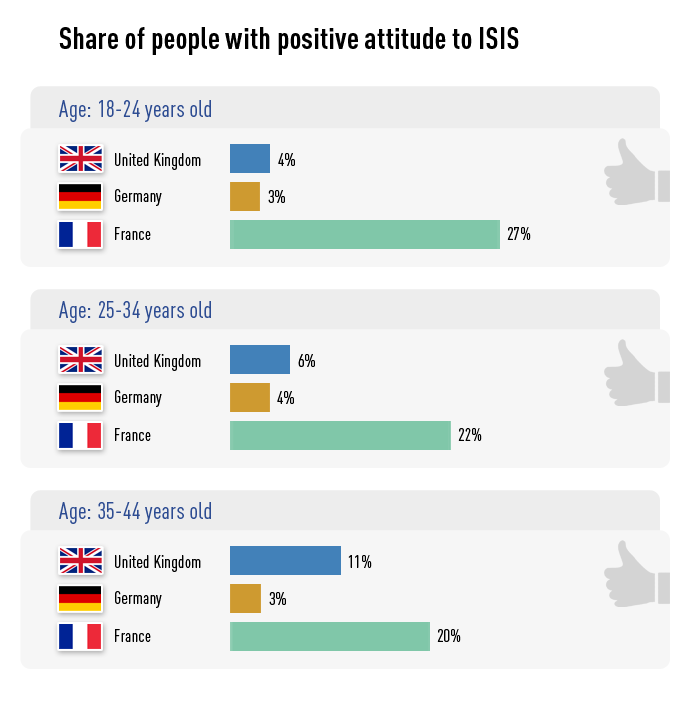 You have to ask yourself: what would possess 20% of France’s 35-44 year olds to have a positive view of ISIS? The same about 11% of the British population? Why would anyone who lives in democracies such as the UK and France support one of the world’s darkest regimes which rapes, kills and decapitates a person live on camera ? These are some of the important questions which the French and British societies have to ask themselves. ← Debate: will the lifting of the #Gaza blockade be a victory for #Hamas?